S.I.M.P. Le. 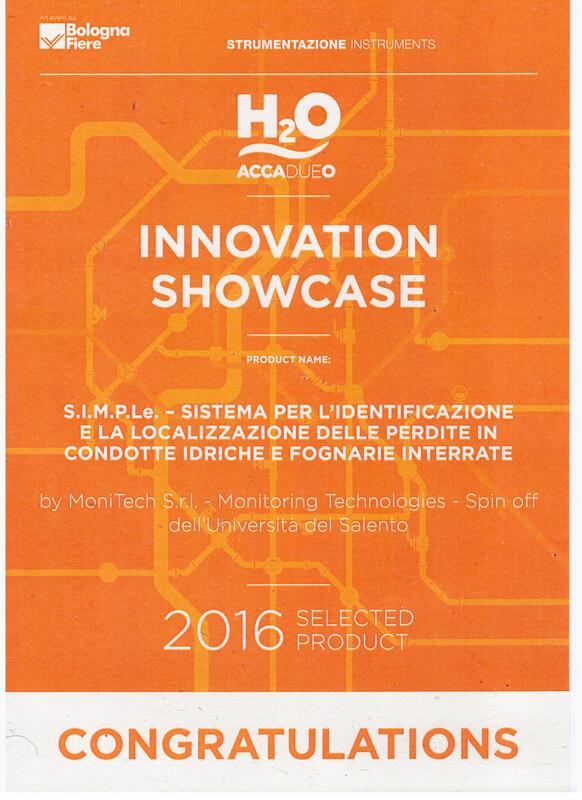 has been awarded as “Selected Product” (in the category Instrumentation) at the Innovation Showcase of the 2016 H20 International Water Exhibition, which took place in Bologna from 19 to October 21, 2016. The 12 winning innovations were selected by a Technical-Scientific Committee composed of renowned industry and academic experts, among 144 Technological Innovations. S.I.M.P.Le. (acronym of System for Identifying and Monitoring Pipe LEaks) is an innovative system for the fast and accurate localization of leaks in underground (water and wastewater) pipes. S.I.M.P.Le. (patent pending) is based on time domain reflectometry, an electromagnetic investigation technique. S.I.M.P.Le. can employed on pipes made of any material (cast iron, PE, gres, etc. ), and this feature makes it useful not only for water pipes, but also for wastewater pipes. 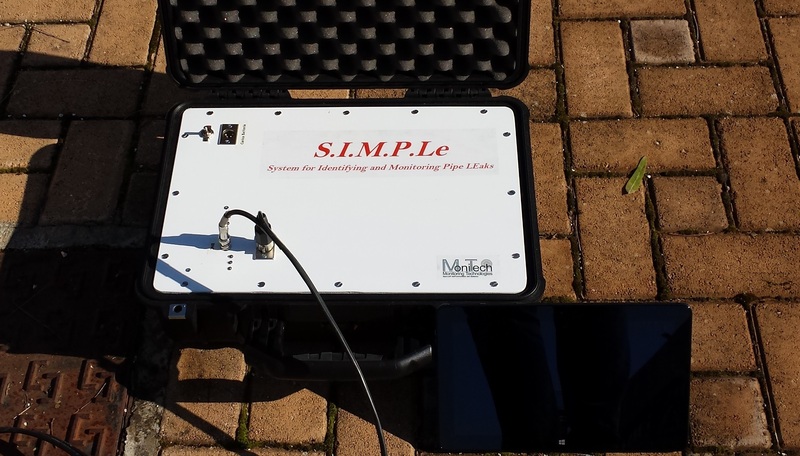 Differently from electroacoustic leak-detection system, S.I.M.P.Le. is not influenced by environmental interferences (e.g., noise) by the diameter of the pipe (or changes of diameters). Additionally, S.I.M.P.Le. does not require specific operating conditions of the pipe (e.g., it does not require high hydraulic pressure in the pipe) and it can be employed for water mains, domestic utilities, adduction pipes, etc. Also, S.I.M.P.Le. is not influenced by electric interferences or by the presence of other services (such as gas pipelines). S.I.M.P.Le. 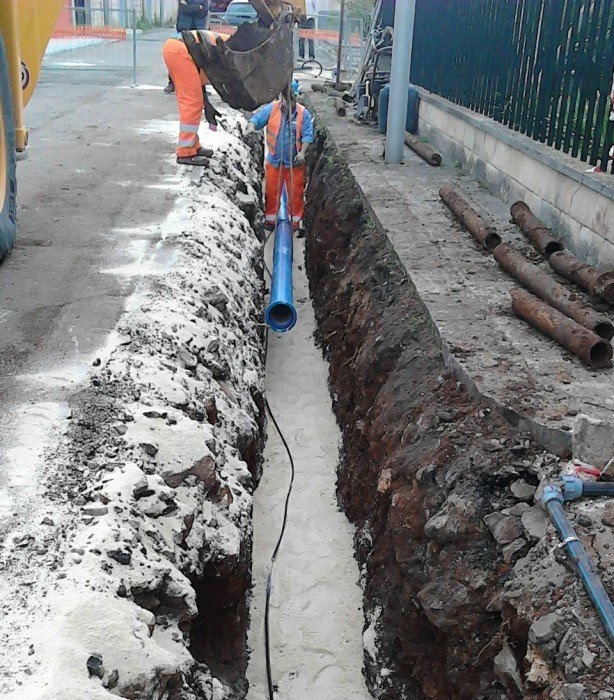 can localize quickly and effectively leaks in underground pipes, even hundreds of meters long. The average daily productivity (i.e. 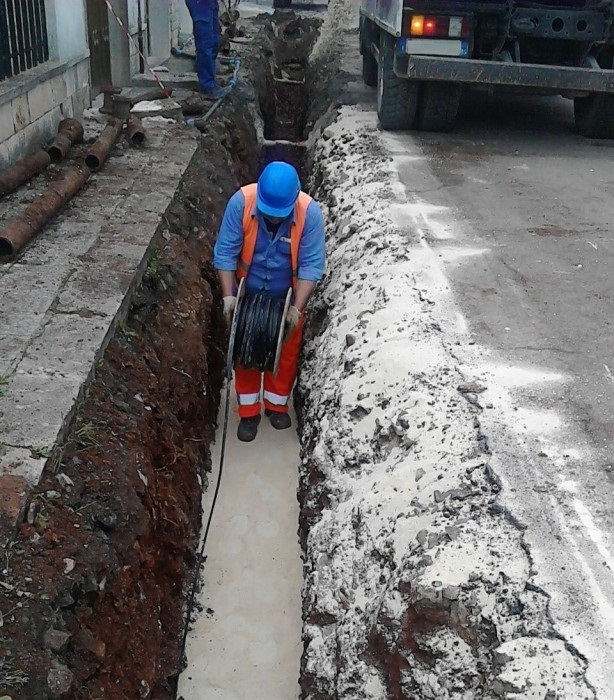 kilometers of pipes that can be inspected, on average, in a day) is higher than 8 km/day, with only one operator, thus dramatically reducing the inspection time and costs. S.I.M.P.Le. guarantees high reliability in the localization of leaks. The exterme flexibility of the system makes S.I.M.P.Le. particularly attractive for leak detection. THE PHYSICAL PRINCIPLE BEHIND S.I.M.P.Le. S.I.M.P.Le. is based on time domain reflectometry (TDR): an electromagnetic technique that exploits the interaction between an electromagnetic signal and the system under test. S.I.M.P.Le. consists of two major parts: the electronic measurement system and the sensing element. The sensing element is laid on the pipe at the time of installation of the pipe. After the pipe is buried, one end of the sensing element remains accessible from the outside through an inspection well. As a result, whenever it is necessary to check for the health status of the pipe, the system is ready to be employed, and the operator just has to connect the measurement instrument and acquire the measurement result. Through a highly user-frieddly and specifically-developed software, it is possible to evaluate in real time the position of the leak. Another important feature of S.I.M.P.Le. is that the implementation cost of this system on new pipes is practically negligible with respect to the cost of installation of the pipe. The implementation of S.I.M.P.Le. may revolutionize the traditional approach to leak-detection. In fact, thanks to this simple equipment, it will be possible to inspect periodically and sistematically the pipes, simply by connection the measurement instrument to the connecting element. Implementing S.I.M.P.Le. in urban areas would be a typical example of “Smart City”-oriented innovation; in fact, S.I.M.P.Le. 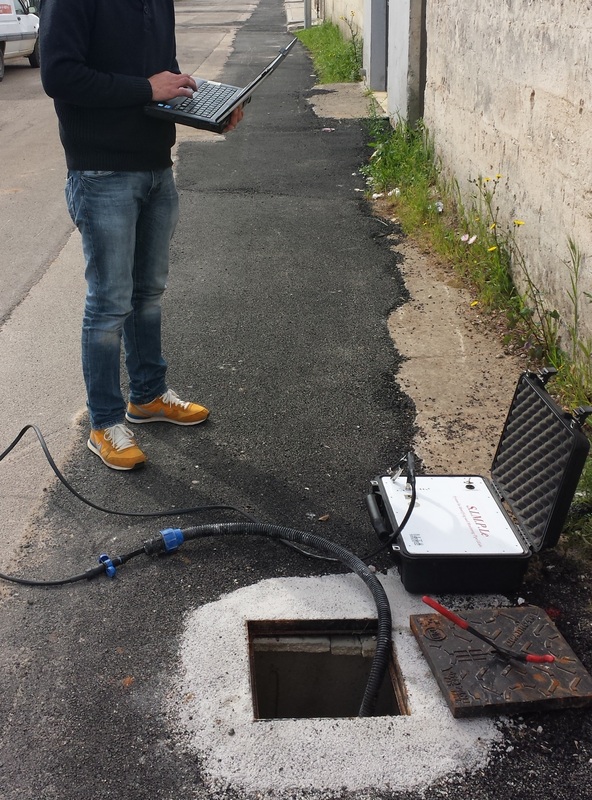 can be adapted to allow the permanent monitoring of the pipe networks, in real time and remotely. Finally, S.I.M.P.Le. (in a slightly different configuration) can be employed also for the inspection of already-installed (i.e. preexisting and not equipped with the buried sensing element) underground metal pipes. The sensing element (necessary to employ S.I.M.P.Le.) is installed concurrently to the installation of the pipe. The sensing element runs parallel to the pipe, as schematized in the figure above. Installation of the sensing element (the operator rolls out the sensing element). Operator uses S.I.M.P.Le. for localizing the leaks. The operator connects the measurement instrument (contained in a portable case) to the connector in the inspection well. Through a laptop, which communicates wirelessly with the instrument, the operator verifies the possible presence of leaks. (picture on the left). In a couple of minutes, thanks to a specifically developed software, the operator localizes the position of the leak and the corresponding GPS coordinates (also useful for future references). 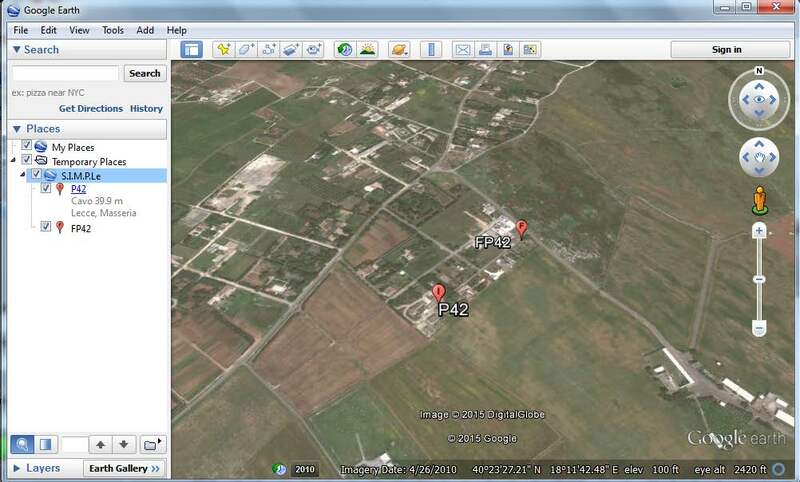 Google Earth image, provided automatically by S.I.M.P.Le., with the GPS coordinates of the inspection point and of the position of the leak.